Speaking of rising, we did not manage to rise quite early enough, so while we made it to church, we didn’t make it to Sunday school. The kids have been to two organized egg hunts, and promptly came home and held their own. However, it started raining as soon as we touched down, so the third egg hunt was held in the house. Fortunately, nothing broke. My most recent egg hunt was more the conventional kind, but I did find the following! Pre-colored and everything. Love how that works. 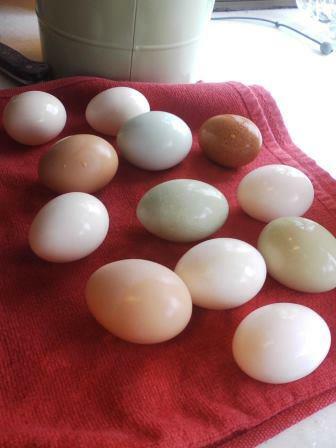 This entry was posted in Pastured Poultry and tagged colored eggs, dozen eggs, Easter eggs, egg hunting. Bookmark the permalink.